On a day when the prospects for our own Derby & Dressage Show this Sunday look decidedly gloomy, it’s nice to have the schedule of the Gaeltacht’s Beach Show on Sunday 2 June to brighten things up. It’s a familiar looking line up of classes so we’re guaranteed an absolutely brilliant day of competition and fun. This is one of the highlights of the riding club year. Everybody who has been to the event in the past knows that it’s not to be missed and every new member should mark it firmly in their diaries in indelible ink. 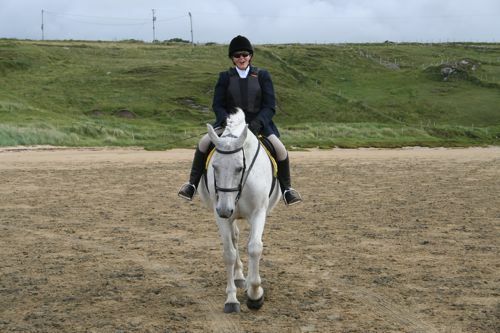 The show takes place in the unique setting of Ballyness Bay in Falcarragh with acres and acres of beach for warming up and a whole extra strand just at the back of the imposing sandunes, just in case your horse needs a break from competitive action. Although there will be no showing at the Beach Show this year, there’s a first-rate schedule of show jumping and dressage classes. Enjoy looking forward to the big day! Pictured below: Beach Show memories from 2013. See the Gallery for more. 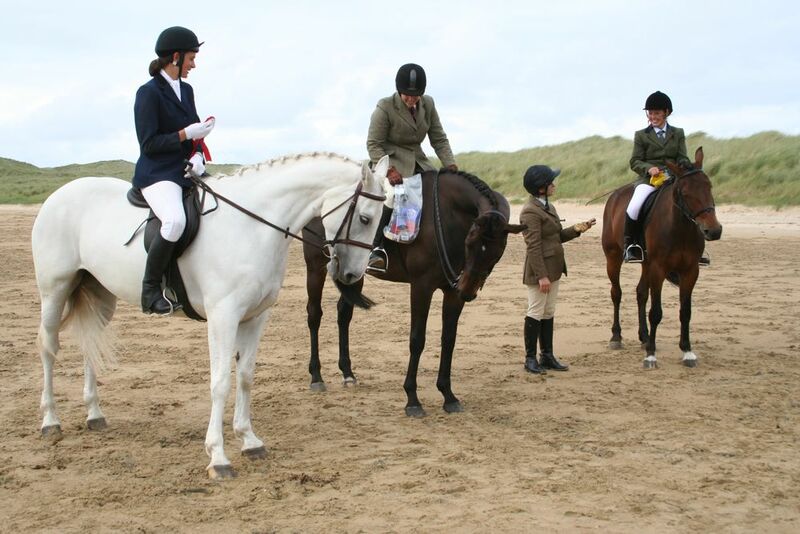 This weekend saw the second attempt at the 2012 Beach Show and, just like our Stranorlar ride-out, the Gaeltacht’s luck held when it really mattered. A lot of determined riders made their way to Ballyness Bay despite a less than convincing forecast and were rewarded for their faith by a great show in comparatively perfect conditions. With the PA system only reaching a small portion of the sandy show ground, many of the results were lost to the wind as they were announced from HQ at the main jumping arena. They’ll filter through on the official Donegal Gaeltacht wavelength sooner rather than later. Between the grapevine, a few eye-witness reports and the shreds of official announcements that filtered through the breeze we know that our wonderful pair of greys, Lizzie under Paddy and Cormac on Charlotte, crowned a great day with a cracking win in the Intermediate & Above Speed Pairs. Cormac was still dealing with the adrenalin rush as he packed up for home and Paddy was observed driving dreamily through the hills on the way back to Letterkenny, reliving every twist and turn of his victorious round. Well done all four of you. 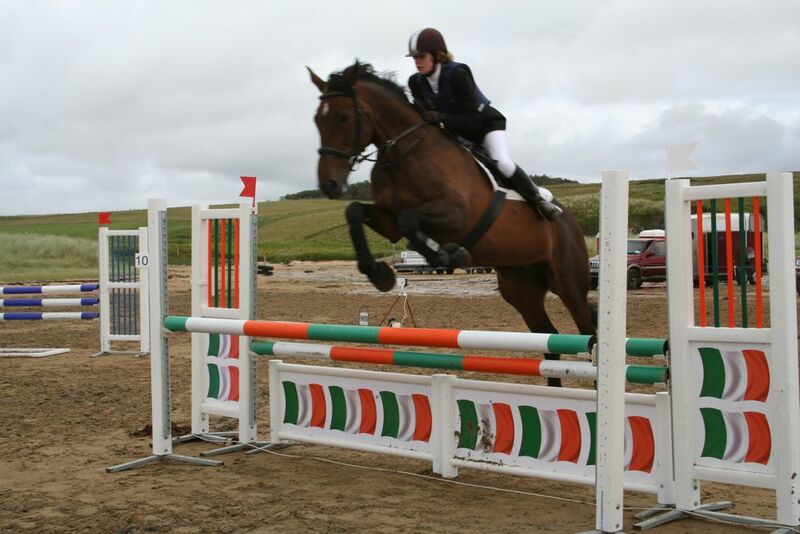 Letterkenny filled the top three spots in the Advanced Intermediate show jumping class with Nadine producing the only clear round of the competition. Damien took second place with Cormac in third. Marina bypassed the competition as Jenny stumbled in her warm-up and favoured a foreleg. In the dressage area, Maura suffered similar poor luck with Hannah just as she completed her warm-up. Hopefully both mares will make a quick recovery. One of the club’s former walking wounded, Fenway, enjoyed his day in the limelight when he won both the Intermediate dressage and the Medium & Heavyweight Hunter Class. 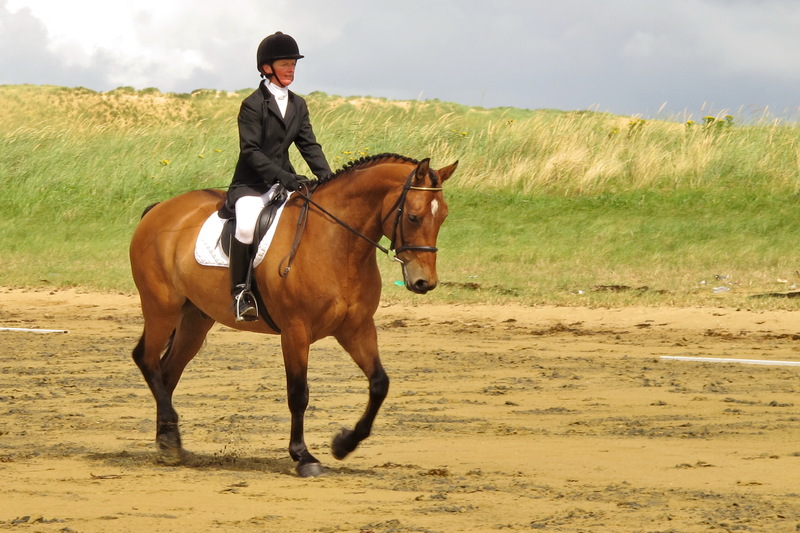 There was no sign of any of his ligament or navicular problems as he then stretched out in gallop before the judges to pip Cathriona Goaley’s lovely Connemara, Curra Whoopi, for the overall Showing Championship. The rest of the results will surface shortly. If there are any photographs, send them through. For now enjoy the small collection in the Gallery. Pictured below: Maura on Hannah, cheerful despite the disappointment of missing her test. Get well soon, Hannah. 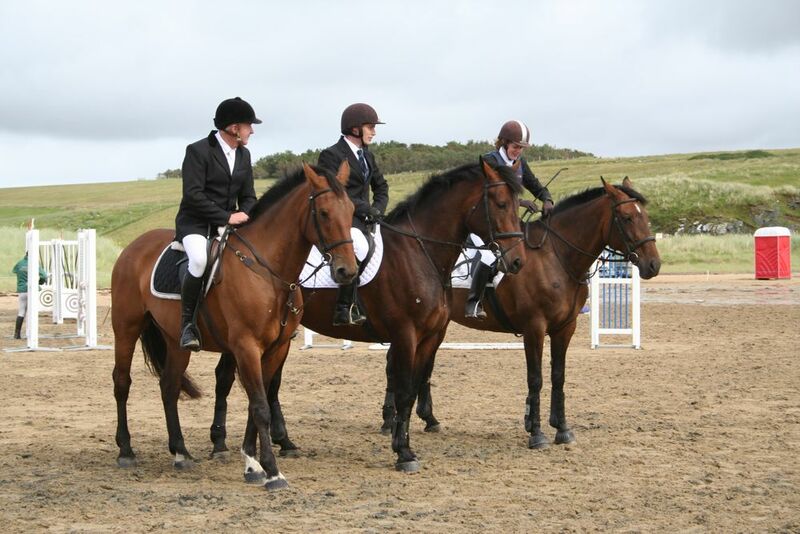 And our trio of Advanced Intermediate campaigners, Cormac, Damien and Nadine on Charlotte, Millie and Molly. Next Sunday sees the rescheduled Beach Show return to Ballyness Bay in Falcarragh. The weather is so unsteady these days that it makes no sense to predict the conditions, but they could hardly be as bad as they were for the original show date! The tide will be fully in at approximately 3:30pm, and will be touching the rocks just past the entrance for a little while. This means that access will be restricted around that time, though vehicles will still be able to drive over the rocks – the choice is yours. The tide will not affect parking or the operation of the show. A short blast of sunshine is all that’s needed to lift the spirits and make the prospect of the Donegal Gaeltacht’s famous Beach Show a real delight. Here’s the full schedule of events. Lots to look forward to. Here’s the schedule — great as always. Now all we need is the weather for it! A quick reminder that anybody who’s planning on competing at the Riding Clubs Festival at Stradbally on Saturday 9 and Sunday 10 June needs to have their entries in by Thursday 19 April (postal) or 3pm on Tuesday 1 May (online). Open to everyone, adults and kids of all ages and abilities. It will start at Manus Kelly’s (near the beach) as one group and split soon after. The lead-rein/non-canter group will loop back around Falcarragh and will have the opportunity to do another section after a break. The other group will head for the hills and the old railway lines. There will be a BBQ afterwards and an opportunity to go to the beach. Exact details will follow soon. To include show jumping, dressage and showing. The increasingly popular show hunter division of our sport will be active over the coming weeks. 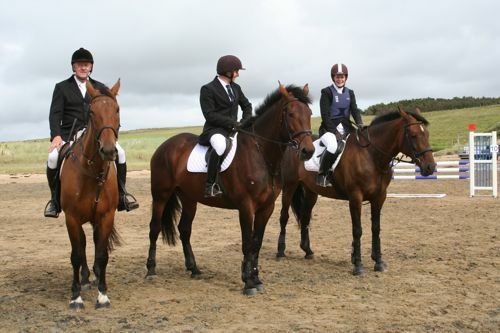 On Sunday 26 February Greenacres EC in Convoy host their annual Winter Hunter Show, a qualifying event for the Northern Ireland Festival in Cavan. The programme includes both working hunter and show hunter classes. Full details on their Greenacres Winter Hunter Show schedule. A week later on Saturday 3 March, The North West Working Hunter Association are holding another of their league shows at Eglinton. For full details, check the NWWHA website. Working hunter classes will soon be vying with actual hunting for popularity, albeit amongst a somewhat different crowd. The ongoing NWWHA league in Coleraine switches venue to Eglinton after Christmas which is good news for anybody from our area who wants to give it a shot. The event will be held in Deane’s Equestrian Centre in Bruckless on Wednesday, 7 December at 7.30pm. Toni will finish the evening with a Q&A session. Admission is €10 adults, €5 child/student. If you are interested please text/call Brenda on 087 631 7425 so that adequate seating can be arranged. There will also be a Working Hunter Show in Deane’s EC on Sunday 11 December.